On Monday, the president released his proposed budget for fiscal year 2019, which includes a provision to close the National Endowment for the Arts (NEA), allowing for $29 million in order to shut down the agency. The budget also proposed eliminating several other cultural agencies, including the National Endowment for the Humanities, the Institute of Museum and Library Services, and the Corporation for Public Broadcasting. Last year, the president’s budget also called for the elimination of the NEA for FY2018 and proposed cutting the FY2017 budget. Congress, however, demonstrated strong bipartisan support and increased the budget of the NEA in FY2017. While the FY2018 appropriations process remains unresolved, the House of Representatives’ Appropriations Committee approved a mere $5 million cut for the NEA for FY18, and the Senate Appropriations Committee has proposed but not yet passed level funding. As you may be aware, the FY18 federal budget has not been finalized — the government has been operating on a series of continuing resolutions since the start of the current fiscal year in October. Last Friday, Congress passed a budget that caps topline federal defense and non-defense spending. Appropriators have until March 23 to determine how to allocate this overall spending to the federal agencies for the current fiscal year, which started in October and has been funded through a series of continuing resolutions. 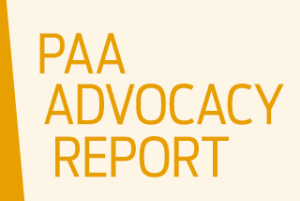 PAA’s member advocates were very active in 2017, sending thousands of letters and making phone calls to Congress urging lawmakers to support the NEA and other cultural agencies. Your letters, phone calls, and invitations to lawmakers and their staff successfully demonstrated the value of the arts in your communities, and we need your continued advocacy throughout the year. The Performing Arts Alliance is proud to be a National Partner for Arts Advocacy Day (March 13), when advocates across the country will urge Congress to appropriate $155 million to the NEA and keep arts and arts education programs vibrant in our communities.